today we are proud to announce the release of our “Worldwide EP” (ESL 171) through ESL Music. This EP is the first release of our upcoming album “Into Bass And Time” (ESL 172) that will be out on March 8 in the USA and April 8 in Europe. The EP starts with title track “Worldwide” which is a sampladelic block party anthem that features Oakland based DJ Zeph on cuts and it is dedicated to all original beat headz worldwide. Then we have “Eternal Searching” with DC native W. Ellington Felton on vocal duties who kicks it with some timeless conscious rhymes who are backed by outstanding live strings from UK string ensemble Entropik. And last but definitely not least is our song “Fear Is The Only Darkness” who gives you some downtempo dopebeat goodness in order to overcome your fear and strengthen your soul. For those of you who are devoted snowboard heads we have the info that we will be rocking the VonZipper party at legendary Air & Style snowboard contest in Innsbruck/Austria this coming Friday. It´s a pleasure to be back again at this event in the beautiful city of Innsbruck. 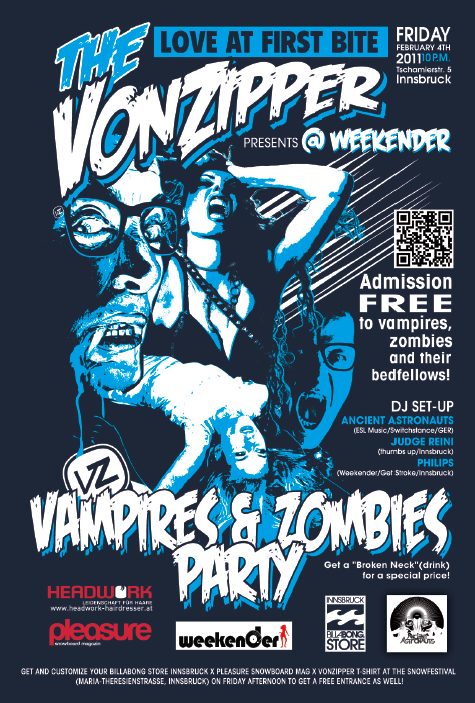 The theme is “Vampires & Zombies” so come and have a dance with us you little monsters! Wanna know what sort of music we will spin? check out our brand new DJ Mix called “Tales Of Tomorrow” that features a lot of our music from Ancient Astronauts and Kabanjak as well as tunes from our labels Switchstance Recordings and Foot Forward Music. Celebrate life & keep it real !! !